Din 1.0/2.3mm Adapters allow for inter-series componentes to interconnect. 1.0/2.3mm Connector was produced starting in 1990 for the communications sector. 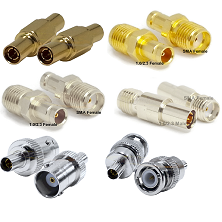 The 1.0/2.3mm in-series and between series adapters allow for quick disconnect various components, but uses a slide on push-pull mating interface which makes it ideal for faster RF installantion applications. The space saving miniature size of the Din 1.0/2.3mm Adapters allow quicker installation and densely packed solutions. 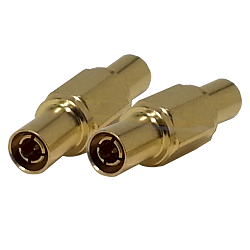 1.0/2.3mm Adapters have both 50ohm and 75ohm impedance and a typical maximum VSWR of >1.20:1 to 4GHz-6GHz. Search For Your Exact 1.0/2.3mm Adapter Now! 1.0/2.3 To SMA adapters have been used to mate previously non compatible components. Their compact designs are ideal for applications where space limitation is a factor. 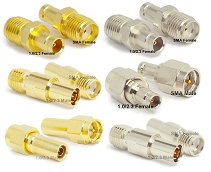 1.0/2.3 To SMA adapters available to perform at 50 Ω with a maximum frequency of 10GHz.